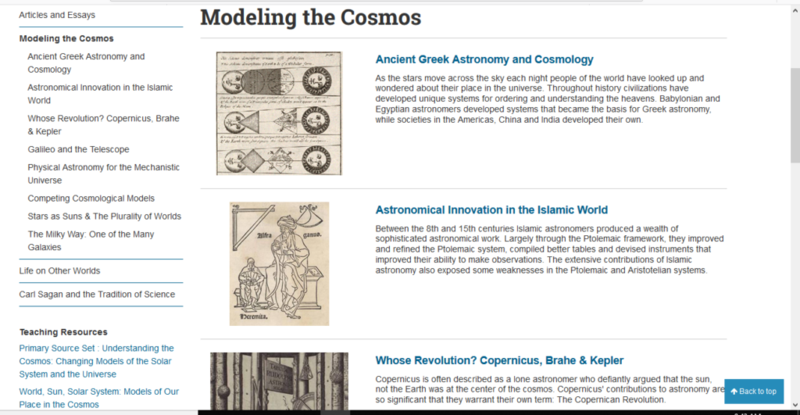 The screenshot above depicts “The Cosmos” front-page- the page the user see’s after clicking on the link. From here, one can read the related articles and essays, find “teaching resources”, as well as continue one’s research through “expert resources”. 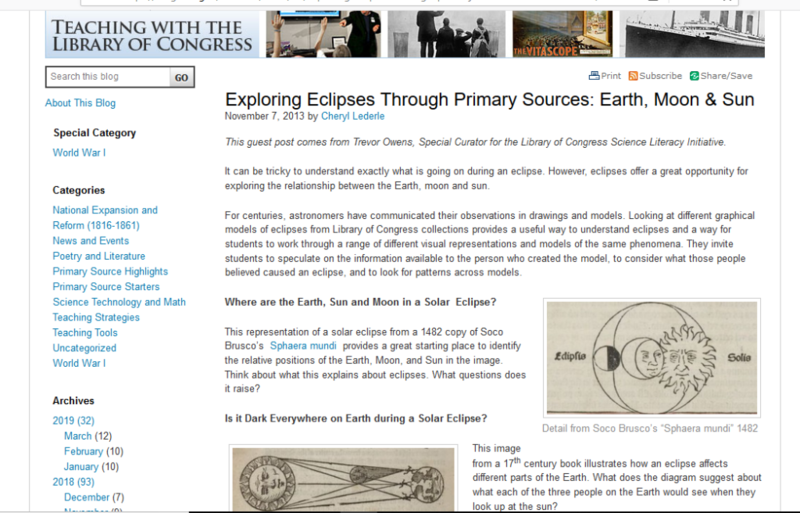 The screenshot above depicts the page the user arrives at after clicking one of the links under “teaching resources”. Here, the user is taken to a blog entitled “Teaching with the Library of Congress”. The Library of Congress does not control what is posted, however they monitor the posts as well as the comments. This specific guest post comes from Trevor Owens. The screenshot above depicts what can be viewed after clicking on a specific article under one of the three primary sections. This image depicts part of the table of contents from the second Draft of Carl Sagan’s book Pale Blue Dot. This image offers a point of entry for understanding Sagan’s writing process. Additionally, you can read and review some of Carl Sagan’s drafts and ideas online in this collection. 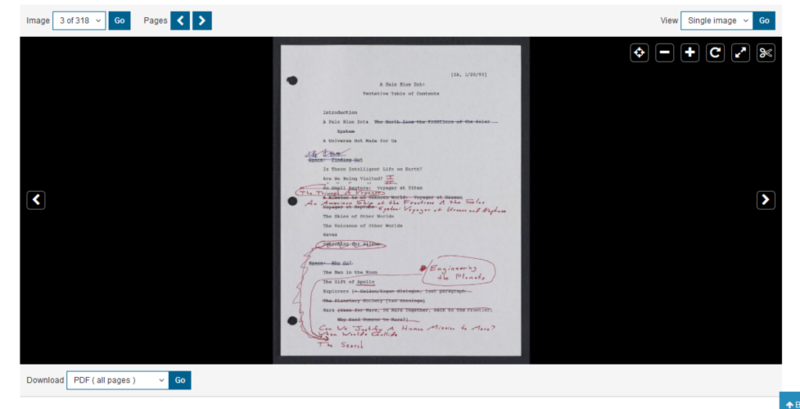 As noted on this page, Sagan was an extensive reviser of his work, for example, this digitized draft of Pale Blue Dot is the second of twenty full drafts in the archive. Each of those 20 drafts is heavily annotated with edits, revisions and changes. Finding Our Place in the Cosmos provides an array of options for its users, such as viewing its’ featured content, finding lesson plans under the “teaching resources”, and continuing one’s studies with the help of the “expert resources”. However, this online collection is only a fraction of the archive’s contents. It is not intended to be comprehensive. Instead it is intended to view various topics and serve as a point of entry to a wide array of primary source. What do Kindles, telegrams, and restaurant menus all have in common? In Paper Knowledge: Toward a Media History of Documents, Lisa Gitelman explores significant historical events in which the use of a document, set of documents, or genre of documents was as key to the shaping of those events as the people who utilized them. Thus, she creates a brief history of the ‘‘scriptural economy’’ through anecdotes at its most crucial moments in the nineteenth and twentieth centuries. Therefore, I will begin by asking a simple question- what is a document? You probably all just rolled your eyes at that question, right? Well, this childish question has been analyzed, examined, and reconsidered for the past century. Additionally, Gitelman argues that “scriptural economy” is an ever-expanding realm of human expression. The document can be manipulated, reproduced, counterfeited, saved, formatted etc. by people. Thus, communication has grown and transgressed across structural borders, from paper through photocopies, and into digital documents. Imagine all the documents you have in your possession right now…you probably have your driver’s license in your wallet, a PDF file saved on your laptop, and an electronic bank statement on your phone. Think about that…all the different forms of documentation and means of communication you obliviously have on you at all times. Paper Knowledge also largely focuses on printing. Gitelman argues that the nineteenth century job in printing is crucial to the history of media. Today, it still has never been fully defined what impact printers had on subjects, authors, editors etc. being printed. Therefore, many questions are still left unanswered in media history- Who was reading these prints? How were they being preserved? Etc. Moreover, printing history can be traced through its transformation during Industrialization and its’ competition with smaller, amateur printers. Gitelman states that during the managerial revolution, secretaries in offices “produced and reproduced documents as means of both internal and external forms of communication”. Consequently, the 1930’s is recognized as an era of “new media for the reproduction of documents”. This can be seen through the use of mimeographs, hectographs, and microfilms. Before reading this book, I was completely oblivious to the complexity of paper. Paper can be paradoxical, ephemeral, literal, figurative, theoretical etc. So, I ask you, what do you think the difference between paper and a document is? Where is the document going to be in the future and what new forms will it show up in? Lastly, will the tactile feature of the document be totally erased in the future? Gitelman’s description of a death certificate explains its’ physical characteristics, such as its’ raised intaglio printing, elaborate watermark, and thermochromic ink. She makes the argument that you do not just read this document but you “perform calisthenics with one”. Will this phenomenon be lost in the future as society is moving toward a more digital, online presence? A few weeks ago, Samir Meghelli, chief curator at the Smithsonian Anacostia Community Museum, told our practicum class that the wall of flyers and advertisements near the end of his exhibit was a last-minute decision made just days before the exhibit opened. Meghelli found hundreds of postings, flyers, papers, and advertisements while doing his research on DC neighborhoods for this exhibit. Instead of letting them go another fifty years without seeing day light, he quickly taped them to an empty wall near the end of the exhibit and created a huge collage. I propose to digitize this section from the Anacostia Community Museum’s “A Right to The City” exhibit to make it more accessible to the public and encourage public interpretation. I believe these should be made accessible to the public because it is, in fact, the public’s history. These signs were created and made by the people of DC, for the people of DC. The audience for this digital project will be the Anacostia community, DC locals and natives, museum goers, and various online researchers. I would use Cornell University’s “Hip Hop Party and Event Flyers Collection” as a comparison project. Just like Meghelli’s collection, Cornell’s collection was created and collected entirely by hand. Their flyers preserve “raw data from the days when Hip Hop was primarily a live, performance-based culture” in the Bronx. They contain information about early “Hip Hop groups, individual MCs and DJs, promoters, venues, dress codes, admission prices, shout outs and more”. To make these important historical documents more accessible to students, researchers, and enthusiasts, Cornell University Library is in the process of making digitized versions of these flyers freely available to the public. This project would be enhancing and adding to the Smithsonian’s online collections database. In addition to the digitizing of artifacts and archival accumulation, I propose that a public dialogue be open to the public to discuss and remember the events that the flyers pictured. This dialogue would be open to the public in the form of a blog, using WordPress. Here, guests would be invited to comment, ask questions, convey memories, and remember the stories behind these flyers. This blog will thus create a data resource for the public. This digital project will practice outreach and obtain publicity through social media sites. 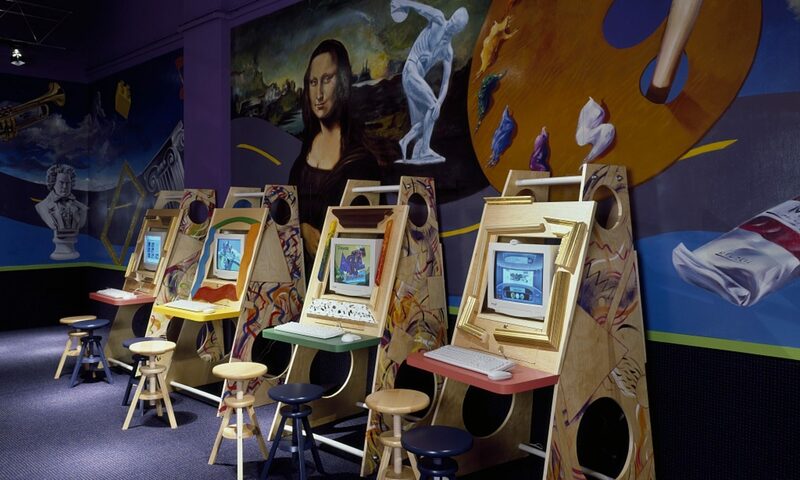 By using sites such as Facebook, Twitter, and even the Smithsonian websites, the newly digitized collection and associated public blog will be highly publicized. People love to remember features of their past, see long-forgotten artifacts, and revel in memories. Therefore, highly accessible resources, such as Facebook, are the perfect way to advertise this digital project and reach many people. I will evaluate the project through the amount of activity the blog attracts. If the blog is not receiving many comments or views, I will know that the collection is not being publicized in the right context and that changes need to be made. Today, if someone described their taste in music by identifying themselves as a “moldy fig” you would probably be extremely confused and reply with a burst of laughter, right? Well, during the Bop era, fans and players of the earlier New Orleans jazz were commonly described using this term. So much of Jazz is entwined in language, and so much of that language also has to do with coded language around race and culture. Beginning in the 1920s and 30s, the Jazz Age effected every aspect of life it touched. Its cultural repercussions could be felt through the prohibition era, fashion, art, women’s rights, African American’s fight for equality etc. The Jazz Age brought African American culture to the white middle class and that introduction, blending, and apprehension can be analyzed through the era’s terminology usage. Using Time Magazine Corpus, I plan to look at how jazz terminology has changed over time. I will explore the trends and their use by using collocates as a way to explore relationships between terms over time in publications. Thus, I will look at the use of words common in jazz culture such as zoot-suits, cats, jam, jive, and licks. I will also look at phrases such as boogie man, popsicle stick, and Tea man. I hope to analyze and find the trends within this terminology to shed light on the evolution of culture, language, music, and people through time. As we are using it for this very blog, we all have the slightest knowledge on WordPress by now. However, if you are at all like me you are still clueless to most of WordPress’s assets and tools. Hopefully, we all recognize the two tabs in the left corner of our screens entitled “My Site” and “Reader”. These tabs will always be visible on your screen when you are logged into your account (making the site easily navigable!). As Kaylee will be covering the “My Site” tab, I will be going over the “Reader” tab. As it is states on WordPress’s support page you can “read posts from all the sites you follow (even the ones that aren’t on WordPress.com), find great new reads, and keep track of your comments and replies in one convenient place: the WordPress.com Reader”. To put it simply, you can find and follow blogs here. And yes, if you take the time to read the directions on the support page WordPress will become a thousand-times easier to use…shocking, right? Followed Sites (Manage): the first link you will see once you click on “reader” is this one. This is WordPress’s equivalent to Facebook or Instagram’s public page. Here you will see the newest posts from the sites you follow in the order they were published. Conversations: here is where you can keep up-to-date on the posts you have liked or commented on. Content will appear on this page when they have new comments or edits. This allows you to read and reply to all conversations that you have already expressed interest in in one place. Search: this one is self-explanatory. You can search for posts and sites on any topic that you so desire. Like Dr. Owens’s states in our syllabus, digital tools are affecting nearly every aspect of historical work. The “reader” tab on WordPress collects, organizes, and presents publications in an easy and accessible manner. This not only allows for more content to be published, but it allows for more people to find and read more material from a broader range of sources. Just like any other form of social media, you can like, comment, share, or visit blogs through this tab. Therefore, I like to think of WordPress’s “reader” tab as a more “intellectual” version of Twitter or Instagram…so next time you mindlessly click on your Twitter App, click on WordPress instead and find a new and stimulating topic to delve into.